Our 1946 Chris-Craft Mahogany (Brightside) U22 project enters the bottom planking fabrication stage today. We will replace all existing planking, which is mostly cedar, with newly fabricated mahogany. Yes, we abhor being unable to save the original planking, but most of it is just too oil-soaked, split and broken. Not replacing these planks means a bottom that is not well adhered to the 3M5200, and cannot hold paint from amidships aft. John and I are dry fitting the original planks in place, and will scribe them on the plywood skin. 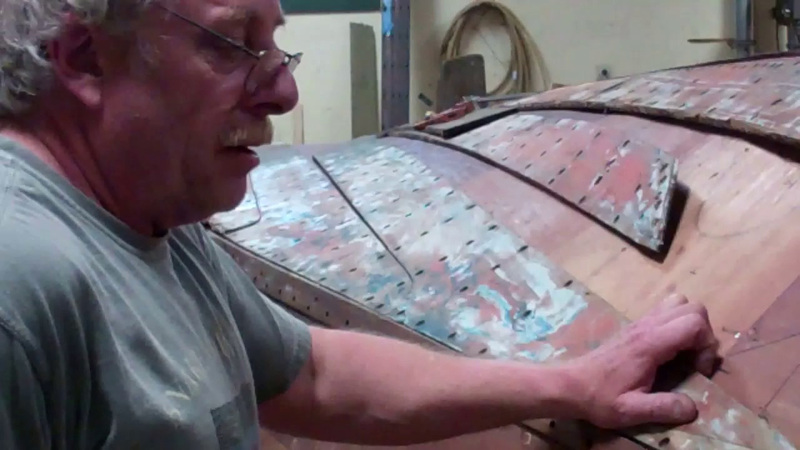 Given the structural work this hull has received, especially removing the twist and hog from it, means that some of these planks, and especially those running to the stem, must be sanded in to fit. Once we are confident we have a perfect set of pattern planks, we will scribe them to new mahogany. The new planks’ faces and edges will be thoroughly sealed with CPES before we begin laying them down. Following a final application of CPES to all exterior surfaces, we will begin applying the first of five coats of Interlux 2000E barrier coat, followed by three coats of period-correct blue antifouling paint. Previous PostPrevious 1960 Cruisers Inc Seafarer Milestone: She’s Ready For Paint!